Breakfast and I have one of those love/hate relationships. I absolutely loveeeeee making breakfast, especially big breakfasts like on Christmas Day where you have eggs, bacon, biscuits, hash, fresh fruits, cinnamon rolls, and a bajillion other things that you know you are going to have leftovers for every day the rest of the week. Yet, I hate that breakfast comes soooooooooo early every single day. It’s like I’m sitting here peacefully sleeping and all the sudden one kid is screaming in my ear for “momo” (that’s the baby yelling for breastmilk) while the other is literally prying my eyelid open while handing me my phone and glasses and telling me it’s time to wake up, she wants to watch Doc McStuffins, and she’s reallllyyyyy hungry. Can I please go to the bathroom and empty my bladder first!? It was very early on in my parenting journey that I learned I needed to have stuff prepped ahead of time. Make bigger batches to at least get me through a few days at a time. 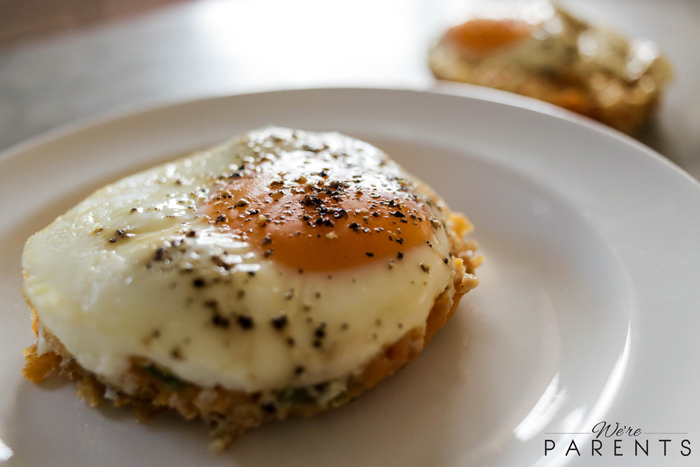 I love making muffins and pancakes because I can freeze them and just pull them out as needed. Let’s be honest for a sec, I rarely have tons of extras in my freezer. But it’s the thought that counts, right? Right! 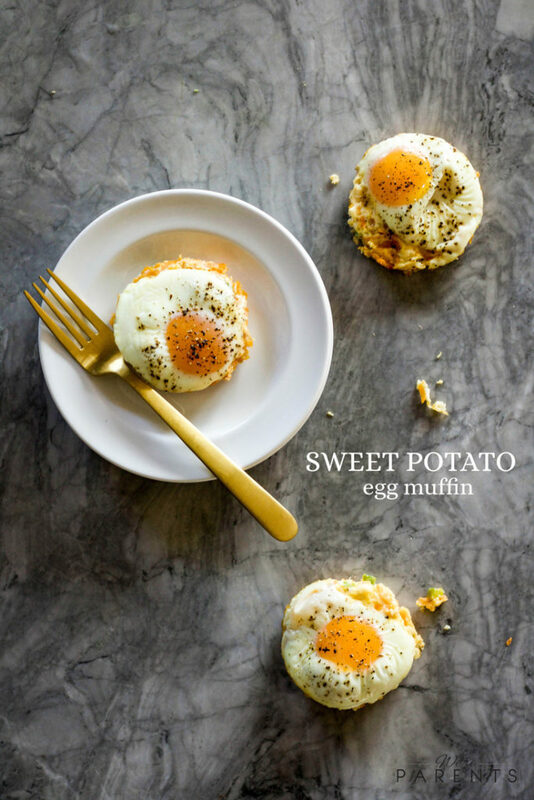 These sweet potato and egg muffins are something that you can have in a rotation that lasts you the good part of the week. I’ll be honest, I’ve never tried to freeze them yet, but the do last for a few days in the fridge if you want to make up two or three batches for the whole family. I love that they satisfy the sweet and savory part of my palate. And I love getting veggies into my girls (and Andrew) first thing in the morning. I hope you enjoy these sweet potato and egg muffins! 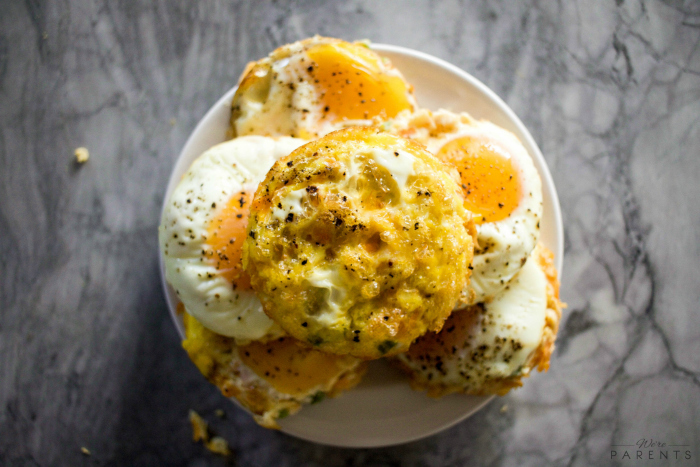 Spray or coat 6 extra large muffin tins with coconut oil. 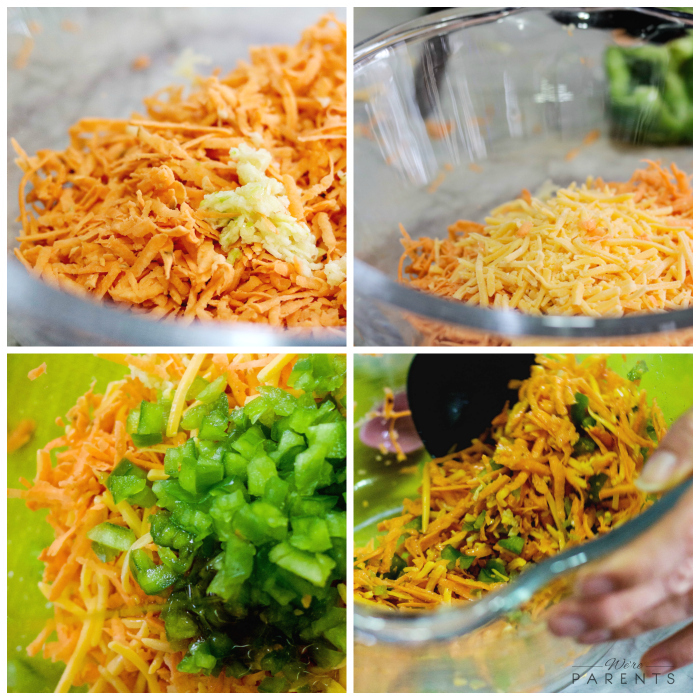 In a large bowl, combine shredded sweet potato, sharp cheddar cheese, green peppers, garlic. and syrup. 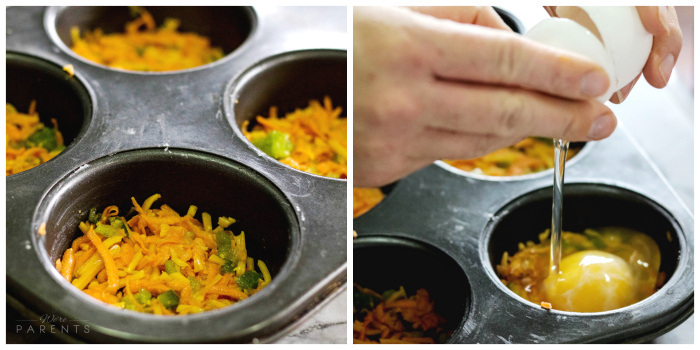 Evenly divide the mixture to the bottom of each of the muffin tins. 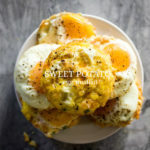 Then crack one egg on one of the sweet potato mixture for sunnyside up eggs, or for scrambled eggs, beat in a bowl then pour on top of mixture. Bake muffins for 15 minutes or until eggs are at desired consistency. Serve immediately or refrigerate and heat up for up to 5 days.